Purpose: Many dental hygiene degree completion (34) and graduate (14) programs offer the majority or all of their course offerings online. While the concept of real-time video web-conferencing has been realized through advances in technology, only 5% of dental hygiene programs report utilizing real-time technologies. The purpose of this study was to use the Community of Inquiry Framework to observe and compare the development of cognitive presence and critical thinking between two different methods of online discussion; asynchronous discussion boards and synchronous video web-conferences. Methods: Students in one online course were divided into two groups. Each week one group completed the course discussion questions through an asynchronous discussion board while the other group completed the same discussion questions via a synchronous video web-conference. Data were recorded and analyzed to compare total indicators of cognitive presence during the two discussion sessions, as well as comparing the various levels of cognitive presence. Results: A total of 117 messages were recorded in the asynchronous discussion sessions and 260 messages in the synchronous discussion sessions. The synchronous video web-conferences achieved significantly more total cognitive presence than the asynchronous discussions (p=0.005). 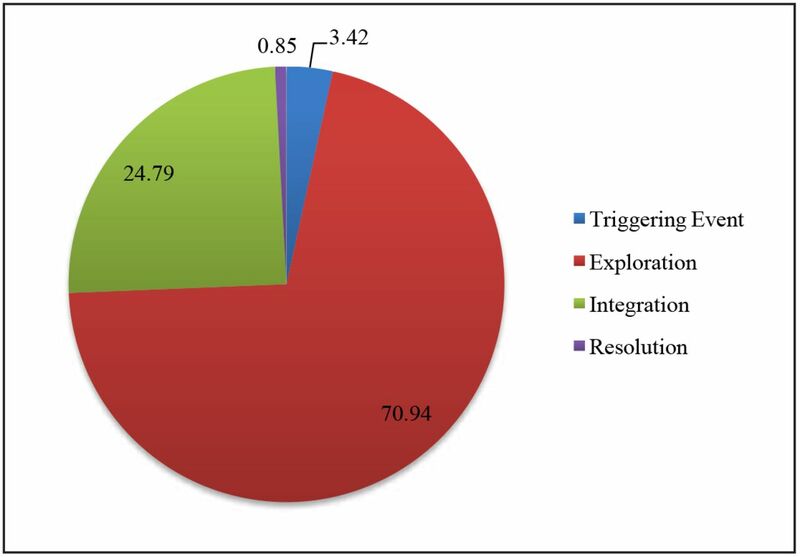 Furthermore, the synchronous discussions reached the highest phase of cognitive presence, the resolution phase, in 10.19% of the messages, while the asynchronous discussions reached the resolution phase significantly less often at 0.85% (p=0.005). Conclusions: This study suggests that synchronous video web-conference in online discussions may create higher levels of cognitive presence in an online course. Higher levels of cognitive presence found in synchronous video web-conferencing may foster critical thinking skills in degree completion and graduate dental hygiene online courses. Research suggests that discussion may be the most critical aspect of online education, as it appears to be the central activity for interactive scholarship as students consider goals, reflect literature, apply methods, add knowledge, provide results, and critically reflect upon achievements, all in a safe community environment.5 Online discussion can be categorized into synchronous and asynchronous, depending on the method of computer mediated communication (CMC). Asynchronous discussion occurs with no set day or time, while synchronous discussion occurs in real time, on a scheduled day during a set time. Asynchronous discussion is by far the most popular discussion format, with 92% of online course offering institutions reporting that they used asynchronous formats in their online courses.6 The majority of asynchronous discussions are conducted utilizing whole group discussion tools, usually on a threaded discussion board. Currently, limited research exists on the comparison of cognitive presence in synchronous video web-conferencing and asynchronous discussion boards. Additionally, no research has been conducted on comparing synchronous video web-conferencing and asynchronous discussion boards in online dental hygiene courses. The purpose of this study was to measure and compare the level of cognitive presence achieved during asynchronous and synchronous discussions in an online dental hygiene course. The context of the study was an undergraduate dental hygiene course on the topic of didactic teaching. This course was delivered exclusively online at a large research university during the 2014 fall semester, and used asynchronous (threaded discussion boards) and synchronous discussion formats (Adobe Connect video web-conferencing). Approval for the research was granted by the Institutional Review Board at The Ohio State University. A total of 15 (N=15) students, consisting of both entry-level and degree completion, were enrolled in the undergraduate dental hygiene course. All students accessed the same university Course Management System (CMS) to gain access to the course content. The course included weekly online discussions accounting for 25% of the student's overall grade. During the first week of the semester, all course participants met synchronously using Adobe Connect to discuss the course syllabus, expectations, learning activities, grading, and course schedule. During this video web-conference, all students were introduced to the learning activity of online discussion and were presented with discussion guidelines. Table II outlines the course discussion guidelines. Each week, the 15 course participants were split into two smaller sub-groups to maximize student engagement during the online discussions.20, 21 Both sub-groups, Team 1(n=7) and Team 2 (n=8), were given the same discussion topic and questions each week. However, each subsequent week the sub-groups alternated the discussion format between asynchronous discussion boards and synchronous video web-conferencing. The asynchronous discussion boards, following recommendations in the literature, were open for discussion for a period of one week.22, 23 During this week, students would write an initial thread on the CMS discussion board in response to a posed, written discussion prompt and replied or commented on other students' posts via written text. The instructor would periodically check on the discussion during the week, and make comments on the posts as needed. The synchronous Adobe Connect video web-conferences were scheduled for Wednesday evenings, from 8:00-9:30 PM (EST). Although 1.5 hours were scheduled, the actual time of each discussion session was dependent on the amount of student participation. The students were required to use a webcam during the discussion, and were also required to have a headset or earphones with a microphone in order to speak during the discussion. The instructor was present the entire time of each video web-conference, and facilitated the discussion by informing students when it was their turn to participate in the conversation. The instructor also added input throughout the discussion and summarized ideas before moving on to a new part of the discussion. This study applied the use of transcript analysis for data collection. Out of the 16-week semester, there were 11 weeks of discussion. Because of the labor intensive nature of transcript analysis, 4 weeks of synchronous and asynchronous discussions were chosen to be transcribed and analyzed. The discussion weeks chosen to be transcribed and analyzed were weeks 3, 6, 9, and 12. This selection included an equal distribution of teams assigned to either synchronous or asynchronous. See Table II. The average age of the respondents was 28.9, with a minimum age of 23 and maximum of 30 years old. All of the respondents indicated at least 4+ years experience of regular computer use, and 71.4% said they were very comfortable or comfortable with taking an online course. Seventy-one percent had previous experience using a discussion board, while only 29% had previous experience using Carmen Connect video web-conferencing. From the eight transcripts, a total of 117 messages were counted in the asynchronous discussions and a total of 260 messages were counted in the synchronous discussions. The asynchronous discussions averaged 29.25 messages in one week on the threaded discussion board, while the synchronous discussions averaged 111.5 messages in an average of 49 minutes. Inter-rater reliability for cognitive presence coding was established in week 3 of asynchronous and synchronous discussions using Holsti's coefficient of reliability, with 90.3% and 90.4% respectively. The negotiated coding approach was employed for week 6, 9, and 12 discussions. Out of the 29.25 average messages coded for cognitive presence in the asynchronous discussions, 100% of the message units indicated some phase of cognitive presence. Although the synchronous discussions yielded an average of 111.5 messages per week, only 59.4% (66.25) of the messages indicated some phase of cognitive presence. The lowest level, triggering events, accounted for 9.43% (6.25) in the synchronous discussions and 3.42% (1) of the messages in the asynchronous discussions. The second level, exploration, compromised 70.94% (20.75) of the asynchronous messages, while only 55.09% (36.5) of the synchronous messages. Of the messages in the asynchronous discussions, 24.79% (7.25), were in the integration phase, compared to 23.40% in the synchronous discussions. The highest level of cognitive presence, the resolution phase, was found most often in the synchronous group, 10.19% (6.75), while the asynchronous discussions reached resolution phase in only 0.85% (0.25) of the messages. Figures 1, 2, and 3 show the complete results of the coding for cognitive presence. The results were analyzed using ANOVA to compare total indicators of cognitive presence. The average number of messages coded for cognitive presence in the synchronous discussions was significantly more than in the asynchronous discussions (p=0.03). A chi-square test was used to analyze the percent of messages in the four phases of cognitive presence. The synchronous group achieved the highest phase, resolution, significantly more than the asynchronous group (p=0.005). 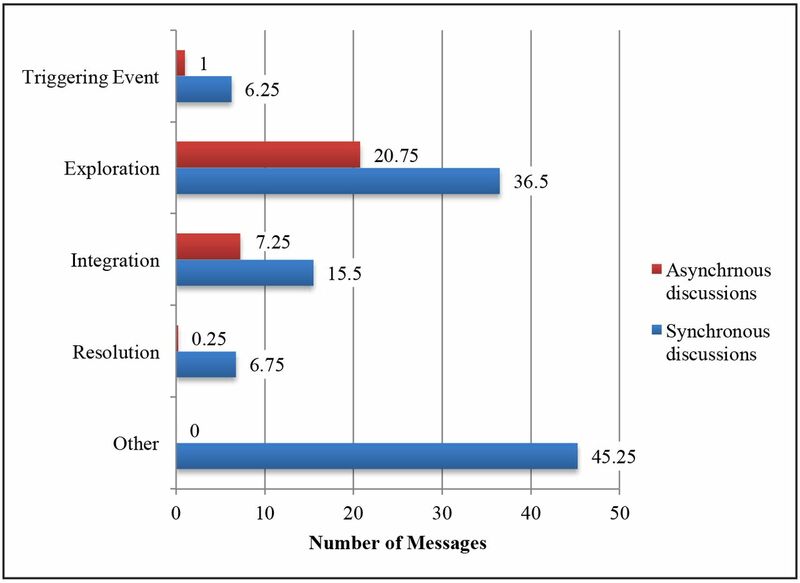 Although both discussion formats asked the same question each week, the findings of this study show the average number of messages generated in the synchronous discussions were significantly more than the average number of messages in the asynchronous discussions. There are several possible reasons for this finding. First, the nature of the medium must be considered. Synchronous discussions occur in real-time, and oral communication tends to be fast-paced, spontaneous, and less structured when compared to text-based communication.22 The spontaneous, more informal environment provided by the synchronous discussion may encourage more participation in the community of inquiry. Second, the teacher involvement was low in the asynchronous discussion boards. Previous literature suggests that increased teacher interaction can have a positive correlation with student participation.27 If the teacher had been more active in the discussion boards, the number of messages generated may have been higher. On the other hand, the teacher was present during the entire synchronous video-conference. Finally, the discussion boards had specific guidelines for how many posts and comments were required to receive full credit. The students were aware that one initial thread and three comments were required. This may contribute to the fact in the four weeks that were analyzed, the number of messages posted in the discussion boards was relatively similar, ranging from 27-31 messages. In contrast, the synchronous discussions had no exact number for how many times they were required to speak during the video-conference. It would be impractical for the instructor to count the number of times each student spoke for grading purposes, so instead of giving a specific number of how many times the student had to speak, the students were simply encouraged to participate. As a result, the numbers of messages in the four weeks of synchronous discussions were varied, ranging from 73-155 messages. The specific number requirement in the asynchronous discussion could have limited the participation, as the students may have not been motivated to participate any more than the required number. The different guidelines for the discussion formats, as well as the difference in teacher involvement, are seen as a limitation of this research study. The amount of time required to complete a discussion were very different between the two formats. The asynchronous discussions occurred during one week, while the synchronous discussions averaged 49 minutes. It is interesting that although the asynchronous discussions took place for a much greater amount of time, the synchronous discussion still generated more message units. The instructor dedicated the same amount of time preparing for both formats, but due to the asynchronous nature of discussion boards, the instructor would have to sign in several days a week to check in with the discussion. In this course, the instructor read and responded to posts on average of twice a week, as well as once again after they were due to grade them and check for required peer comments. This averaged to at least 2 hours a week devoted to discussion boards, which produced little interaction between the instructor and the students. Many dental hygiene faculty have reported that the greater amount of time and labor intensive demands that need to be devoted to an online learning environment are a disadvantage when considering online teaching. An unexpected outcome of this research was the finding that synchronous discussions may be a good option for those faculty wishing to produce high quality discussion in a lesser or more condensed time frame. Our research indicated that both discussion formats produced high levels of cognitive presence. 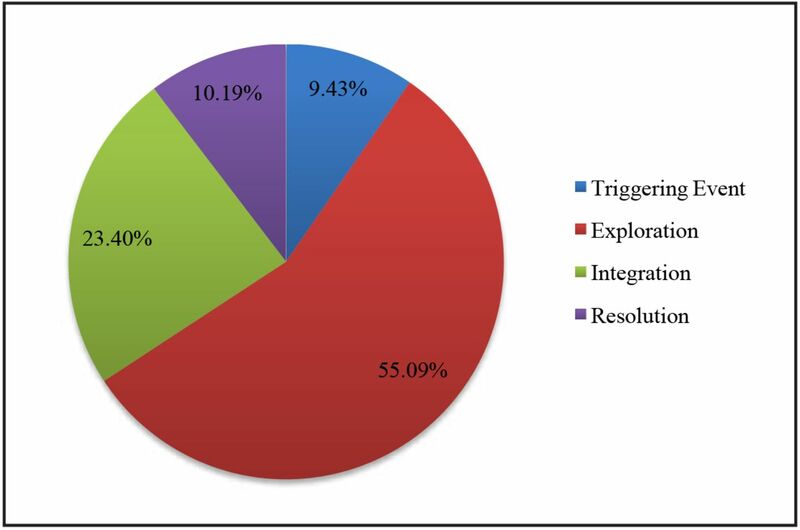 The exploration phase was indicated most often in the asynchronous discussion, which is consistent with previous literature. However, the synchronous discussions achieved the highest phase of cognitive presence, the resolution phase, more often than the asynchronous discussions. Two considerations for this result could be the increased levels of social and teaching presence that were indicated in the synchronous discussions, as well as the increase of teacher interaction. Teaching presence is seen to be the binding factor between the three elements of the Community of Inquiry framework.29 The increased indicators of teaching presence found in the synchronous discussion may have fostered higher levels of learning. Also, the increased involvement of the teacher may have prompted the students to achieve higher levels of learning by providing direct instruction as a subject matter expert. Social presence has also been shown to increase levels of cognitive presence29, as it sets the tone of the community and allows for students to feel more comfortable expressing their ideas and opinions in a discussion. This lays the foundation for higher-levels of learning, and it has been shown that the perceptions of social presence significantly predict perceptions of cognitive presence.29 In this study, the higher levels of social presence in the synchronous discussions may be correlated with the higher levels of cognitive presence. Finally, the students in this sample were undergraduate students that may not be able to achieve high levels of learning without specific coaching. In courses that used solely asynchronous, threaded discussion boards, significant teaching presence and social presence must be established to foster high levels of cognitive presence. This could be achieved by increased teacher participation, the teacher initially setting the tone for establishing social presence, and being specific to what level of cognitive presence is expected to be achieved by the students (e.g. “I want you to come to a solution and test your hypothesis”). The limitations of the research design also include a small sample size. This research was conducted in one online dental hygiene course with a limited number of student participants. Due to the small-N involved in this research study, it is possible that some of the basic assumptions for common statistical techniques such as ANOVA may have been violated. Also, the study population had a 7 year age range and differences in their experience with computer use and online courses. Twelve of the 15 students in this class were traditional, entry-level dental hygiene students who were well acquainted with each other from face-to-face interactions outside of this online course. These experiences could have affected the results. Time commitment is a concern with online educators, as most admit to online teaching as labor and time intensive.30 In this study, synchronous video web-conference discussions averaged less time on the instructor than asynchronous discussion, while producing higher levels of cognitive presence. Synchronous discussion may be an option for faculty looking to decrease the amount of time required to facilitate a discussion without compromising the student-teacher interaction and collaboration. The findings from this study also suggest that synchronous video web-conferencing may allow for higher levels of cognitive presence to develop in an online course. Critical thinking skills are identified as an important core competency31 and accreditation standards32 in both undergraduate and graduate dental hygiene education. A higher level of cognitive presence may help dental hygiene programs meet the critical thinking accreditation standard and core competency of their program. More research is needed to compare these two formats of discussion. Future research should include equivalent guidelines for participation, equivalent teacher involvement in the both equivalent teacher involvement in both discussion formats, and a larger sample size. Amy L. Molnar, BSDH, MDH is a lecturer, Division of Dental Hygiene; Rachel C. Kearney, BSDH, MS is an assistant professor, Division of Dental Hygiene; both at the College of Dentistry, The Ohio State University, Columbus, Ohio.
. ADHA's focus on advancing the profession: Minnesota's dental hygiene educator's response. J Dent Hyg. 2007 Apr;81(2):53.
. Building online learning communities in a graduate dental hygiene program. J Dent Hyg. 2014 Aug;88(4):213-28.
. Dental hygiene programs: On-Line/distance learning programs-degree completion [Internet]. Chicago (IL): ADHA; 2015 Nov [cited 2016 Apr 16]. Available from: http://www.adha.org/resources-docs/71615_Bachelors_Online_Distance_Programs.pdf.
. Dental hygiene programs: On-Line/distance learning programs-master's degree [Internet]. Chicago (IL): ADHA; 2015 Nov [cited 2016 Apr 16]. Available from: http://www.adha.org/resources-docs/71616_Masters_Online_Distance_Programs.pdf.
. Scholarship assessed: evaluation of the professoriate.1st ed. San Francisco, CA: Jossey-Bass Inc; 1997. 130 p.
. Distance education at degree-granting postsecondary institutions: 2006-07. Washington, DC. National Center for Educational Statistics, Institute of Education Sciences, U.S. Department of Education; 2008 Dec. 15 p. Report No. : NCES 2009–044.
. The first decade of the community of inquiry framework: a retrospective. Internet and Higher Education. 2010 Jan;13(1):5-9.
. Online training: analysis of interaction and knowledge building patterns among foreign language teachers. Journal of Distance Education. 2007 Spring;21(3):39-58.
. Online discussion as a mechanism of conceptual change among mathematics and science teachers. Journal of Distance Education. 2005 Spring;20(2):21-39.
. Recognizing and promoting collaboration in an online asynchronous discussion. British Journal of Educational Technology. 2004 Jul;35(4):421-31.
. Replicating the use of a cognitive presence measurement tool. Journal of Interactive Online Learning Summer. 2009;8(2):140-55.
. Ask and you will receive: how question type influences quantity and quality of online discussions. British Journal of Educational Technology. 2008 Feb;39(5):888-900.
. Compulsory participation in online discussions: is this constructivism or normalization of learning?. Innovations in Education and Teaching International. 2008 Apr;45(2):183-92.
. Asynchronous discussion in support of medical education. Journal of Asynchronous Learning Networks. 2003 Feb;7(1):56-67.
. Technologies that assist in online group work: a comparison of synchronous and asynchronous computer mediated communication technologies on students' learning and community. J Educ Multimed Hypermedia. 2015 Jul;24(3):263-79.
. A framework to analyze argumentative knowledge construction in computer-supported collaborative learning. Computers & Education. 2006 Jan;46(1):71-95.
. Student perspectives on videoconferencing in teacher education at a distance. Journal of Distance Education. 2008 Feb;29(1):107-18.
. The influence of web conferencing on graduate students' sense of community in an online classroom [dissertation]. [Beaumont]: Lamar University; 2013 May. 196 p.
. The effects of web conferencing on the community of inquiry in online classes. Journal on Excellence in College Teaching. 2015 Jan;26(3):121-43.
. Learning through discussions: comparing the benefits of small-group and large-class settings. Journal of Political Science Education. 2011 Jan;7(1):48-64.
. Influence of group size on students' participation in online discussion forums. Computers & Education. 2013 Mar;62:123-29.
. Critical inquiry in a text-based environment: computer conferencing in higher education. Internet and Higher Education. 2000 Mar;2(2-3):87-105.
. Computer conferencing and higher-order learning. International Journal of Online Learning. 1998 Jan;7(1):41-54.
. Critical thinking, cognitive presence, and computer conferencing in distance education. American Journal of Distance Education. 2001;15(1):1-24.
. Content analysis for the social sciences and humanities. 1st ed. Reading, (MA): Addison-Wesley; 1969. 235 p.
. Revisting methodological issues in the analysis of transcripts: negotiated coding and reliability. Internet and Higher Education. 2006 Feb;9(1):1-8.
. How to structure online discussions for meaningful discourse: a case study. British Journal Education Technology. 2005 Jan;36(1):5-18.
. Researching the community of inquiry framework: review, issues, and future directions. Internet and Higher Education. 2007 Jul;10(3):157-72.
. Exploring causal relationships among teaching, cognitive and social presence: student perceptions of the community of inquiry framework. Internet and Higher Education. 2010 Jan;13(1-2):31-36.
. Use of distance education in dental hygiene programs. J Dent Ed. 2002 Oct;66(10): 1136-45.
. Core competencies for graduate dental hygiene Education. J Dent Ed. 2012 Jul;76(7):908-12.
. Accreditation standards for dental hygiene education programs [Internet]. Chicago (IL): CODA; 2013 Aug [updated 2017 Feb, cited 2016 Apr]. Available from: http://www.ada.org/en/coda/current-accreditation-standards/.